You are currently browsing articles tagged First General Assembly. 1849 — Inauguration of the Rev. James W. Alexander, D.D., as professor of ecclesiastical history and church government in the theological seminary at Princeton. Born near Gordonsville, Virginia, in 1804, the eldest son of Archibald Alexander, James was raised in a household filled with theological giants of the faith. His father was the president of Hampden-Sydney College at that time. But by the time that schooling had begun for James, his father had taken the pulpit of the Third Presbyterian Church in Philadelphia, Pennsylvania in 1807. Then in 1812, as the new seminary called Princeton began in New Jersey, the Alexander family moved there and Archibald Alexander became the first professor of that new divinity school. Young James graduated from the College of New Jersey in 1820. And while he studied theology at Princeton Seminary from 1822–1824, he would not be ordained by the historic Hanover Presbytery until 1827, having first served about three years as a tutor. He died on July 31, 1859. 1925 — The First Annual Conference of the League of Evangelical Students was held in Grand Rapids, Michigan, November 20-24, 1925. At this conference nineteen schools were represented, eleven theological seminaries and eight Bible schools, and these represented student bodies from Texas to Canada and from the Atlantic to the Pacific. The Conference, with its keynote on unswerving loyalty to the Bible as the only authoritative rule of faith and practice, was held on the campus of Calvin Theological Seminary and Dr. J. Gresham Machen spoke on the theme, “The Church’s Historic Fight against Modernism from Within.” An early 20th-century campus ministry, the League ran its course in a brief fifteen years, overtaken by the wider appeal of InterVarsity. 1936 — The Rev. Harold S. Laird, pastor of the First Independent Church, Wilmington, was elected president of the Independent Board for Presbyterian Foreign Missions [IBPFM], succeeding the Rev. Dr. J. Gresham Machen. Dr. Machen had also retired that same year as Moderator of the First General Assembly of the Presbyterian Church of America. The IBPFM had been organized in 1933 in response to the failure of the PCUSA to remove modernists from the foreign mission field. In reaction, the PCUSA’s General Assembly had, in 1934, issued a “Mandate” forbidding PCUSA ministers and laity from involvement with the IPBFM. Their refusal to step down from their participation with the IBPFM led to Machen and about a dozen others being defrocked or otherwise kicked out of the denomination. 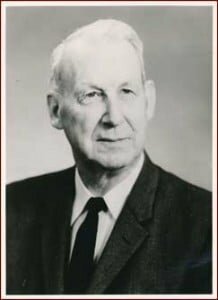 1952 — Addison Soltau was ordained on this day in 1952 and installed as pastor of the First Evangelical Presbyterian Church, Memphia, Tennessee. Born in Seoul, Korea, the son of missionary parents T. Stanley and Mary Cross (Campbell) Soltau, Addison came from a long and illustrious line of noteworthy Christians. He graduated from Wheaton College in 1949 and prepared for the ministry at Faith Theological Seminary, later earning a Th.M. degree from Calvin Seminary in 1966 and the Th.D. from Concordia Seminary in 1982. Leaving his pulpit in Tennessee, he labored as a missionary in Japan from 1953-1970, served as a professor at Reformed Bible College and at Covenant Theological Seminary, and has, since 1989, served on the pastoral staff of several churches in Florida. He is currently an associate pastor at the First Presbyterian Church of Coral Springs, in Margate, Florida. I suppose we could simply have stretched out the events of this twentieth day of November into the next six years with the six posts listed above, but it seemed good to explore some of the notable events and people for this date all at once. In that way, we behold the Lord’s providence of sovereignly governing both good and bad events on this day in Presbyterian history. James reminds us of the significance of one day when he asks and answers, “What is your life? For you are a mist that appears for a little time and then vanishes.” (James 1:14, ESVOpen in Logos Bible Software (if available)) To be sure, who among the people and events mentioned above ever wondered what else occurred on their day of November 20? That is why all of us need to take the words of James to heart when he wrote in verse 15, “Instead you ought to say, ‘If the Lord wills, we will live and do this or that.” (James 4:15, ESV). Use this last biblical thought as a prayer today as you read this post, and venture out into your world. And so our Saturday tours through PRESBYTERIANISM FOR THE PEOPLE ended last week. Apparently that book proved popular enough that its author, the Rev. Robert P. Kerr, was encouraged to expand the work and just five years later he published THE PEOPLE’S HISTORY OF PRESBYTERIANISM THROUGH ALL THE AGES (1888). For its summary nature, and for the benefit of the time line presented here at the end, we present today the final chapter of the latter book. Rev. 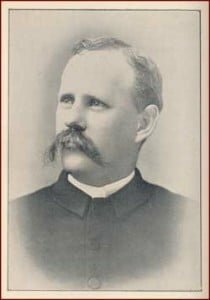 Kerr was born in 1850, began his ministerial career in 1873 as pastor of a church in Lexington, Missouri, and served churches in both the old Southern Presbyterian denomination [1873-1903] and in the Presbyterian Church in the U.S.A. [1903-23]. Honorably retired and in ill health in 1915, he died on March 25, 1923. We have followed the history of Presbyterianism through a course of many centuries; have looked upon its origin, development, sufferings, defeats and victories; and have taken a survey of its present condition and prospects. The attentive reader cannot fail to have seen that the spirit of Presbyterianism, as exemplified in its fruits, is that of the broadest catholicity as well as love of the truth. Truth, and man, for God, is its motto. The tendency of its operations has been to liberate men from superstition, to give them a thirst for knowledge and for liberty. It is the mother of republicanism in church and state. America, and Great Britain with its world- encircling colonial system, would not have been what they are to-day but for Presbyterianism, in Italy, Switzerland, France, Holland and Scotland. Knowledge and liberty dwell together, and they have come largely from the influence in past ages, of that heaven- born principle of which this book is a history. The world owes to Presbyterianism a debt it does not feel, and one it can never repay. Comparatively few of the millions of men who enjoy the inestimable blessings of civil and religious liberty care to inquire whence they came, or stop to think how different might have been their lot but for the sacrifices of those who lived long ago, and whose names are oft forgotten. But those who do study causes and effects in the affairs of men, and who follow trains of events back to their origin, will come to render honor where it is due. The philosophy of truth is written in the annals of mankind ; its principles are outlined forever in the profile of history; and there always will be seers who will interpret to men the lessons of the past. Therefore there is no danger that the great doctrines and polity that cluster around the Presbyterian name will ever be forgotten. We behold in the Presbyterian Church a glorious benefactor of mankind in all ages; but it is not enfeebled. It is stronger than ever. We believe that the future has for it as great a work as the past has had, and we sons of a noble church are proud of our mother. Does the Presbyterian Church despise its sisters, or claim to be the only Church of Christ? No; if it did it would be a contradiction of its very genius and spirit. It acknowledges all God’s people as brothers, and all evangelical churches as equals, inviting their ministers into its pulpits, receiving them into our ministry without re-ordination, and welcoming their members to a communion table which it claims not as its own, but the sacred meeting place of all Christians for fellowship with one another, and with their common Lord. This book will have been written in vain if its perusal should foster a spirit of narrow sectarianism. But if it serve the purpose for which it is designed, it will tend to make Presbyterians who read it love their own church more, and at the same time look upon the world and all the church of God with a broader Christian sympathy. A.D. 387. Augustine, pastor of Hippo, baptized. 1415.— John Huss burnt at Constance. 1536. — Calvin published his Institutes. 1560. — First General Assembly met at Edinburgh. 1564. — Death of John Calvin. 1572. — John Knox died. 1628. — First Reformed Church established in New Amsterdam (New York). 1638. — National Covenant signed in Greyfriars Churchyard, Edinburgh. 1643. — Westminster Assembly convened at the Abbey. 1648. — Confession of Faith and Catechisms sanctioned by Parliament. 1679. — Battle of Bothwell Bridge. Covenanters defeated. 1682. — Francis Makemie came to America, and settled in Maryland. 1685. — Revocation of the Edict of Nantes. 1688. — Restoration of Episcopal Church of England and Ireland. 1705. — First Presbytery organized at Philadelphia. 1706. — First recorded ordination to the ministry in United States, at Freehold, New Jersey; John Boyd the candidate. 1717. — The Synod of Philadelphia organized. 1727. — Log College, the mother of Princeton, founded. 1734. — Great awakening under Jonathan Edwards. 1739. — Movement headed by Whitefield. 1758. — Synods of New York and Philadelphia reunited. End of Old Side/New Side schism. 1775. — Mechlenberg resolutions adopted. 1776. — John Witherspoon in Congress. 1788. — General Assembly organized. 1837. — The Church divided into two parts, called Old School and New School. 1861. — Separation of the Old School Church into Northern and Southern Divisions. 1869. — Reunion of New School and (Northern) Old School, at Pittsburgh, November 10th. 1875. — Organization of the Alliance of Reformed Churches throughout the world holding the Presbyterian System. Beginnings of anything can be interesting. This author once planted a mission church in a sizeable Midwest city. He had done all the preliminary preparation for the mission. Several families committed themselves to the endeavor. The first worship service was planned in a spacious worship center of an evangelical church, rented for the occasion. We all went with expectations of a good beginning, but only one family showed up for the beginning worship time. It is true that God did some extraordinary things in the first six years of our ministry there. I rejoice that this established church is progressing ahead by means of being a mother church to several congregations. In 1560, a Scottish Reformation Parliament abrogated and annulled the papal jurisdiction for Scottish churches, ending all the authority flowing from Rome. Not only had the Creator fitted and qualified them, but so had their Great Redeemer fitted and acquired them to raise up a Church faithful and true to the Scriptures of the Old and New Testaments. It may have been small in man’s estimation at the beginning, but the Spirit of God judged it otherwise. He would bring the increase in His time. So be faithful, dear reader, in the place where God has planted you. Keep looking to Him, for He will accomplish His will through you, in the work and place where you have been planted to serve our Lord and Savior. As we are now upon the annual season when the various Presbyterian denominations typically meet in General Assembly, the following short post seems appropriate to repeat here. It is taken from an 1836 issue of THE CHARLESTON OBSERVER. Attendance and participation in the courts of the Church—those meetings of the Session, the Presbytery and the General Assembly—always involve some level of personal cost and expense for each attendee. For some the cost is greater than for others. This is one reason why the meetings of Presbytery and General Assembly move regularly from one location to another, so that inconveniences are averaged out over time for all the officers of the Court. All of this is nothing new. There have always been those who questioned the expense, and perhaps not without good reason, each in his own situation. But as you will read, there are also good and compelling answers urging upon Commissioners their full participation at the Courts of the Church. Mr. Editor.—Is it my duty to travel between four and five hundred miles, at an expense of at least fifty dollars [at least a month’s wages in 1836], for the sole purpose of attending Synod, when in all probability its business would be as well conducted without as with my presence? And in so doing I should be necessarily absent from the people of my charge two, if not three Sabbaths? 1. Should every member of Synod conclude from similar premises that it was not his duty to attend, there would be no meeting at the time and place appointed, and of course no business done. 2. One member frequently changes the entire complexion of a meeting; and no one has a right to suppose that his presence is a matter of indifference. 3. If the member can afford the expense it will be money well laid out, and if not, his people should aid him. The time occupied in going and returning, may often be profitably employed. The journey may be of advantage to his health. In conference with his brethren he may receive a new impulse in his Christian course, and be better prepared to labor with effect among his people on his return; so that neither he nor they will be losers by his absence. 4. When he was set apart to the work of the Ministry, he was expected to make many sacrifices for the good of the cause. And if his brethren to whom he has solemnly promised subjection in the Lord, did not regard attendance upon the Judicatories of the Church as important, they would not have exacted an apology or excuse for non-attendance. 5. Instances are exceedingly rare that a Minister has ever cause to regret the sacrifices which he has made in attending the Judicatories of the Church. On the contrary he most usually feels himself amply repaid for all the sacrifices which it has cost him. 6. The present crisis of the Church seems to demand more than ever a full attendance both of Ministers and Elders, cost what it may. 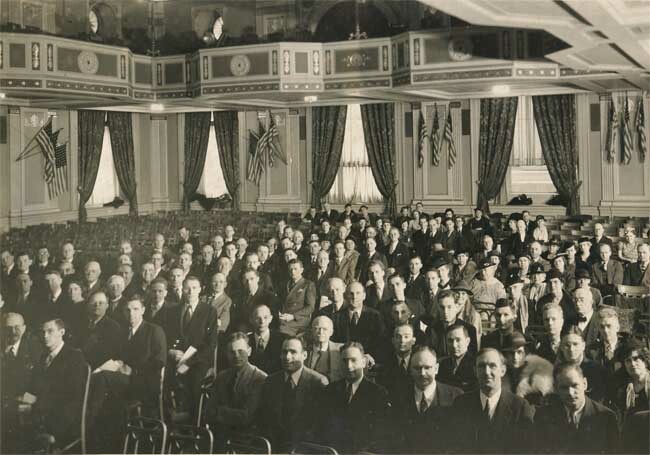 Image source: Photograph of the First General Assembly of the Presbyterian Church in America [originally named the National Presbyterian Church, and renamed a year later. 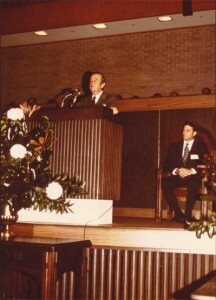 ], meeting at the Briarwood Presbyterian Church, Birmingham, Alabama, December 4-7, 1973. The photograph is found as part of the Records of the Presbyterian Journal, Box 243, file 11, at the PCA Historical Center. This year marks the 40th anniversary of the organization of the Presbyterian Church in America. 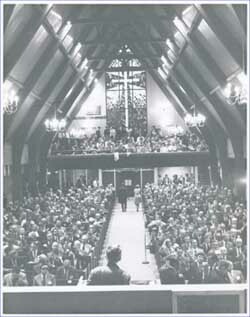 The denomination’s First General Assembly met December 4-7, 1973. Policy wonks can view the Minutes of that First General Assembly, here. Rights of Particular Churches in Relation to the Denomination and its Courts. 3. That we, the undersigned, met in Hopewell, Virginia at 11:00 A.M. on October 30, 1973.
a. The corporation of a particular church, through its duly elected trustees or corporation officers, (or, if unincorporated, through those who are entitled to represent the particular church in matters related to real property) shall have sold title to its real property, and shall be sole owner of any equity it may have in any real estate. No superior court, as such, shall have any claim whatsoever upon any real property or any equity in any real estate, or any fund or property of any kind by or belonging to any particular church, or any board, society, committee, Sunday School, class or branch thereof. The superior courts of the church may receive monies or properties from a local church only by free and voluntary action of the latter. b. All particular churches shall be entitled to hold, own, and enjoy their own local properties, without any right of revision whatsoever to any presbytery, synod, or any other courts hereafter created, its trustees or other— officers. c. The provisions of this chapter are to be construed as a solemn covenant whereby the Church as a whole promises never to attempt to secure possession of the property of any congregation against its will, whether or not such congregation remains within or chooses to withdraw from its body. All officers and courts of the Church are hereby prohibited from making any such attempt. The intent of the provisions of this section are unamendable and irrevocable. d. Particular churches need remain in association with Presbytery, synod, or any other courts hereafter created, only so long as they themselves so desire. The relationship is voluntary, based only upon mutual love and confidence, and is in no sense to be maintained by the exercise of any kind of force or coercion whatsoever. A particular church may withdraw from its presbytery, synod, or any other court hereafter created, at any time for reasons which seem to it sufficient, by orderly ballot at a legal meeting of its congregation or corporation. A simple majority of those present and voting shall decide the issue. With some further changes, the principles of the above text was subsequently incorporated into the Book of Church Order of the Presbyterian Church in America, as part of BCO Chapter 25. Charles Darby Fulton was like many other conservative Presbyterians who chose to stay with the mother church rather than leave to join the newly formed denomination as it took a stand against modernism and apostasy. Their reasons for staying may have been varied, but conservatives like Fulton in many respects stayed for the tougher fight, for their numbers were even fewer after the exodus. There is however something unique about the Rev. C. Darby Fulton that makes you want to know more about the man. He was widely typified as a Christian statesman. One way in which he demonstrated that quality of character was in the fact that, while he did not choose to come into the Presbyterian Church in America at its formation in 1973, he nonetheless was quite willing to bring a message during the PCA’s first General Assembly. Some conservatives who chose not to come into the PCA ignored or even opposed the new denomination. Darby Fulton was different, and that difference is part of what marks him out as a true Christian statesman. It’s part of what makes you want to know more about the true character of the man. Charles Darby Fulton was born on September 5, 1892, in Kobe, Japan. His parents, the Rev. Samuel Peter Fulton [1865-1938] and Rachel Hoge Peck Fulton, were missionaries sent out by the Southern Presbyterian Church. Darby Fulton was educated at the Presbyterian College of South Carolina, graduating there with the B.A. degree in 1911, and then earning an M.A. from the University of South Carolina in 1914 [note his thesis topic, in the blbiiography below] before turning his attention to preparation for the ministry at Columbia Theological Seminary. Graduating from Columbia in 1915, he lastly attended Princeton Theological Seminary, and there earned the STB degree n 1916. Rev. Fulton was ordained on June 25, 1915 by the Presbytery of Enoree [PCUS]. During the time that he was attending Princeton, he transferred his ministerial credentials to the PCUSA, and supported himself by serving the Glassboro and Bunker Hill churches, 1916-1917. Then upon graduation from Princeton, he was received back into Enoree Presbytery and the PCUS as he answered a call to missions work. It was at about this time that Rev. Fulton married Nannie Paul Ravenel, of Spartanburg, South Carolina, in October of 1917. Departing for the PCUS operated Japan Mission, the Fultons served there from 1918 until 1925. Thereafter Rev. 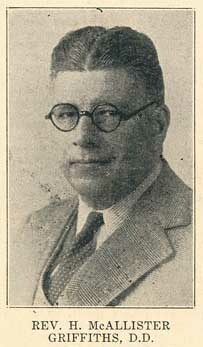 Fulton served as Field Secretary, 1925-32, and then as Executive Secretary, 1932-61, for the PCUS Board of Foreign Missions. Dr. Fulton served as a professor at his alma mater, Columbia Theological Seminary, from 1962 to 1965, and on September 1, 1965, was entered on the rolls of Presbytery as honorably retired. During his lifetime, he had received a number of honors, including having served as the Moderator of General Assembly [PCUS] in 1948. The Presbyterian College of South Carolina awarded him the Doctor of Divinity degree in 1924 and he received the LL.D. degree from King College in 1952. Following his retirement, the Rev. Dr. C. Darby Fulton lived another twelve years, and he died on May 27, 1977, at the age of 84, while residing in Nashville, Tennessee. Prior to his death, he had established a fund to assist the Kobe Theological Seminary in Japan. 1914 – Financial Condition and Its Relation to Character. M.A. thesis at the University of South Carolina. 1949 – Report on China. 1959 – Lectures: Series of three lectures delivered before the Synod of Virginia at Massanetta Springs, June 29-30, 1959. 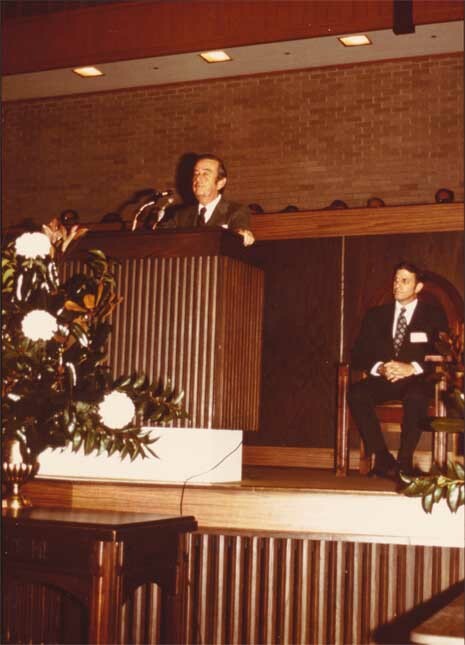 1973 – “The Excellency of the Knowledge of Christ,” in Addresses delivered during the First General Assembly of the National Presbyterian Church. Montgomery, AL: The Office of Administration, 1973. pp. 32-34. Undated – “The Gospel is Relevant. Weaverville, NC: The Presbyterian Journal, n.d. Tract, 12 p.
Every life has a key word. With some it is money; with others, pleasure; with still others, fame. With Alexander the Great it was conquest; with Napoleon, France; with Edison, science; with Paul, it was Christ. The meeting was called to order in the auditorium of the New Century Club in Philadelphia, Pennsylvania on June 11, 1936 at 2:35 p.m. With those facts before you, this could be any gathering of any group of people for any purpose. But this meeting was unique in that it was the start of a new Presbyterian denomination. The opening address by the Rev. H. McAllister Griffiths stated that the teaching and ruling elders gathered, were there to “associate ourselves together with all Christian people who do and will adhere to us, in a body to be known and styled as the Presbyterian Church of America.” (Minutes of the First General Assembly of the Presbyterian Church of America, pg. 3) He then went on to state that “by the warrant and authority of the Lord Jesus Christ we constitute ourselves a General Assembly of the Presbyterian Church in America (Minutes, pg 3). Forty-four teaching elders and 17 ruling elders with another seventy-nine lay people were present. Eleven associate teaching and ruling elders wanted their names to be listed as present. The next section of the opening address was highly important as it laid down the doctrinal, confessional, and ecclesiastical basis of the new church. It stated, “We do solemnly declare (1) that the Scriptures of the Old and New Testaments are the Word of God, the only infallible rule of faith and practice, (2) that the Westminster Confession of Faith and Catechisms contain the system of doctrine taught in the Holy Scriptures, and (3) that we subscribe to and maintain the principles of Presbyterian church government as being founded upon and agreeable to the Word of God.” (Minutes, p. 4) The minutes states that all teaching and ruling elders, and deacons, shall subscribe to the statement. Dr. J. Gresham Machen was elected the first moderator. The Rev. Paul Woolley was elected clerk of the assembly. A committee was organized to prepare a second General Assembly to be held on November 12 – 15 in Philadelphia. This committee would recommend which version of the subordinate standards the new church would receive and adopt, the Form of Government, Book of Discipline, and Directory for the Worship of God. Another committee was set up on Church Organization and Roll. The last committee established by this general assembly was that of Home Mission and Church Extension. Pictured above, the meeting of the Second General Assembly of the Presbyterian Church of America. The photograph is part of the Allan A. MacRae Manuscript Collection at the PCA Historical Center. To my knowledge, no known photograph of their First General Assembly survives. There was also a declaration that those attempts at censure by the Presbyterian Church USA, aimed at teaching and ruling elders who were now part of the Presbyterian Church of America, were henceforth “terminated, lifted, and declared at an end.” (Minutes. p. 13) Two presbyteries were erected by the General Assembly, that of Philadelphia, and New York and New England. With that, the first General Assembly of the Presbyterian Church of America was closed with prayer. Words to Live By: It was a good start. Many challenges were ahead. Faithful ministers who stood boldly for the faith would lose church buildings, manses, and pensions in the years ahead. We, like them, are always to look away from things that perish, and keep our hearts and minds set on Jesus Christ, the Author and Finisher of our faith.